What is it? Entering this temple of Argentinian steakstronomy, the interior articulates sophistication and rather refined taste, with plenty of leather and dark stone. Drinks: Cocktails are conscientiously crafted, but without grandiose complication. There are a few inventive originals like the Flower of London (Earl Grey and Jasmine infused gin, Limoncello, fresh peach and lemon juice served straight up) and the Black River Cobbler (rosé wine, pear liqueur, fresh pear purée and wild blackberries shaken and served tall over ice) that were both $88. Classic cocktails with a spin caught our eye, and we recommend the San Lucas ($98), which is in essence a Cuban moijito with the Argentine twist of cinnamon infused rum, matched only by the Pommelina cocktail, a vivacious blend of cachaça or vodka with orange, grapefruit, lime, lemon and sugar–an Argentine take on the Brazilian classic Caipirinha ($88). They’re familiar enough to be comforting, but altered in such a way to be pleasantly unusual. Sommelier Andres is befittingly from Buenos Aires and guides you to find some spectacular regional wines, which we have to say is an artfully element to the experience at Gaucho. We found highlight in the Zuccardi, which on the nose resembled uncannily a moscato, only to be far drier and layered in taste. A wonderful discovery that denotes the knowledge and passion of the staff assembled. Eats? For the starters we tried the famed empanadas, that were bang on and well worthy of their renown. 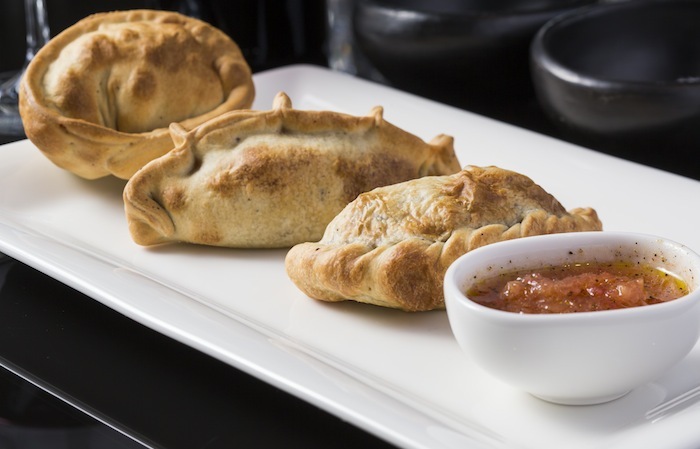 The beef empanada comes filled with three different types of beef, and the cheese empanada filed with provolone, mozzarella, cheddar and divinely sweet caramelised onion and oregano. Though hard to spoil any cheese/onion/herb flavour combination, these were executed very well. 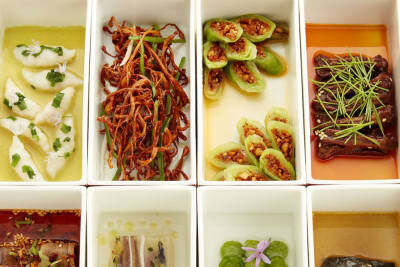 The ceviche sampler ($268) is a great way to taste all the flavours of Latin America, within which we found our highlight to be the tuna with toasted sesame seeds, spring onion, orange and a wasabi and soy dressing. The prawn (Ecuadorian) and scallop tiraditos are somewhat less exciting and a little raw onion heavy, but still very fresh. 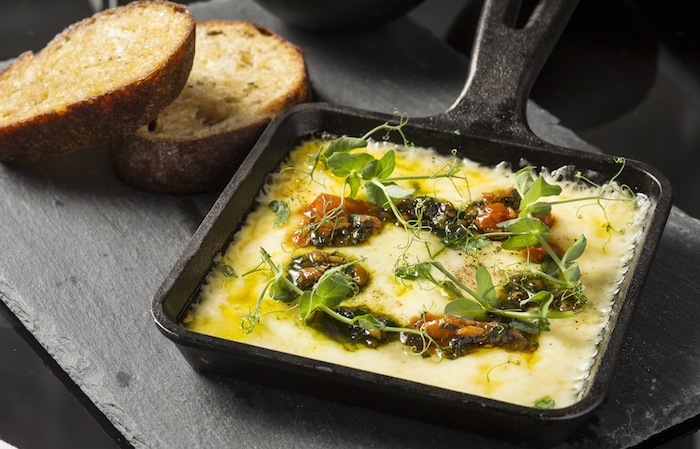 A recommendation of the 48 hour dry aged provoleta was suggested by the distinctly lovely and outrageously Argentinian Flavia, assistant manager at Gaucho, and so we tucked into the oozy stringy skillet of cheesy goodness, dotted with dollops of wonderful green pesto and sun blushed tomato salsa. The starters were all tasty, but took thirty-five minutes to arrive. Fortunately, Gaucho are very kind to present some of the tastiest bread imaginable while you wait; sourdough and little cheesy rolls that are warmed and invitingly dense. Add a little of the chimichurri sauce and it is like hundreds of tiny women with maracas dancing around your mouth. We chose two of the medallions of rib-eye and fillet, after having the full array of meat choices presented to us raw on a cutting board. 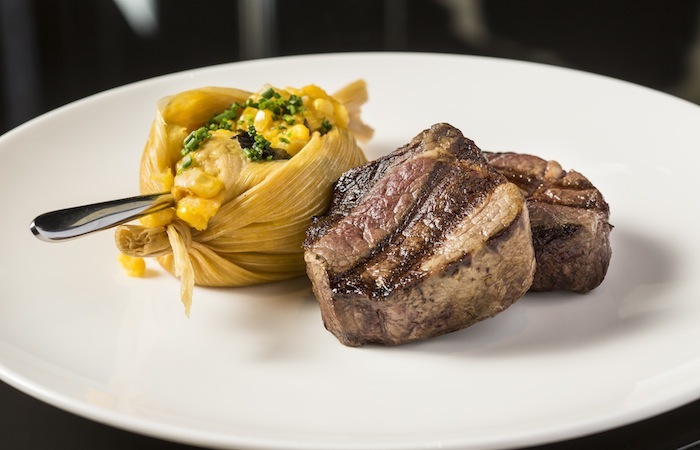 This is a ritual devotees of Gaucho will be most familiar with, and salutes the emphasis the restaurant places upon the high quality cuts all imported directly from Argentina. We tried the medallions ($298 for 225g) that are thick cut and allow the succulence of the meat to shine, having being chargrilled to medium rare idealism. We also opted for a churrasco de chorizo ($498 for 500g); a sirloin that is spiral cut, and marinated for 48 hours in garlic, parsley and olive oil, to make it very flavourful. It is also worth noting, although we didn’t try it, the Gaucho sampler is great value, at only $1000 for 1.2 kgs of all four cuts. We were a little confused as to the potent absence of steak knives, given we were in a steak house, but nevertheless the butter knife does its job of cutting through the tasty meat, even if it is not supremely tender. Sweets: Dessert is its own show; with the both dulche de leche themed desserts clear winners from the four we sampled. The salted dulce de leche and hazelnut cheesecake with coconut Italian meringue, with salted dulce de leche and milk chocolate ganache ($68) magically melds the flavours of toffee and nut together, which is a nice shift from the standard Nutella-esque choc-hazelnut combination most of us are well accustomed to. 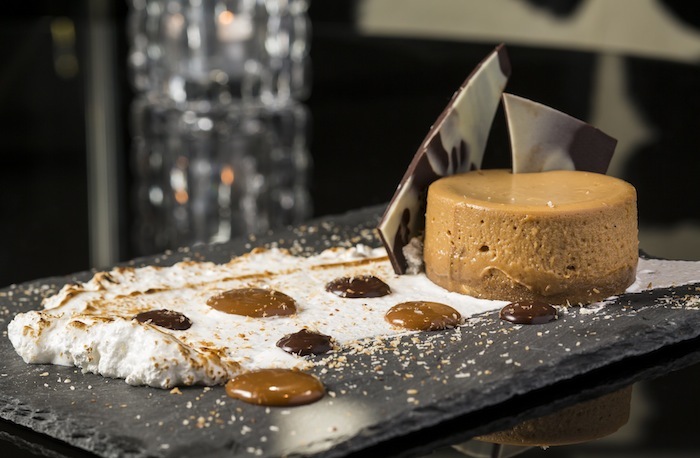 The dulce de leche fondant, with an Amaretto curd, chocolate crumble and vanilla ice cream ($68) is exclaim-out-loud flavourful, with a rich warm caramel trickling from the agreeably moist cake-case. The Don Pedro and chocolate brownie were both nice, but pale in comparison. 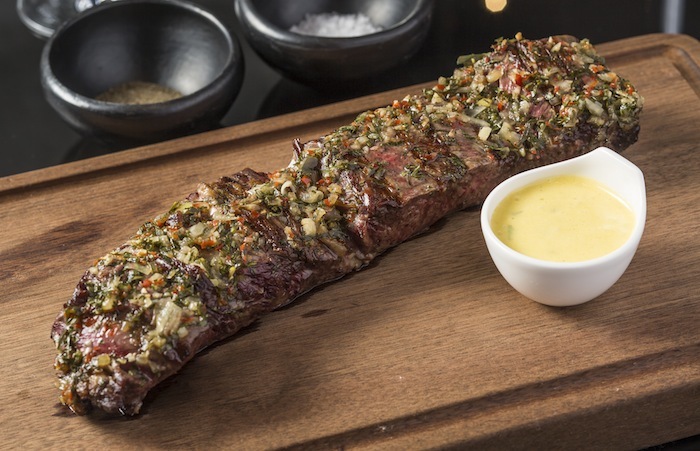 Verdict: Gaucho is irrefutably not where you will bag a bargain, but by the same token, is brimming with attentive staff, high quality ingredients and impeccable Argentinian flavours. The starters and desserts wowed as much, if not more, than the meat. 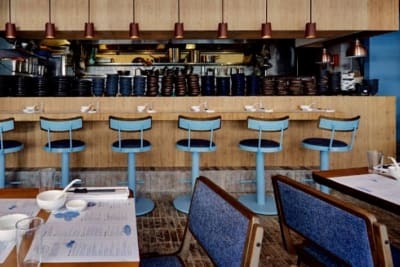 The restaurant fiercely champions the simple yet refined flavours of Argentina, and proudly upholds a thoroughly South American ethos. A welcome additional to central Hong Kong.